We’ve been all too conscious for a while now that the accommodation for our senior boys, in the top floors of the Millgate Building, needs extensive improvements to meet the needs of young men in the 21st century. We’re excited that preparatory work for this remodelling is now underway, and that we’ve received plans from Ashworth Walker Architects showing us how the finished rooms will look. 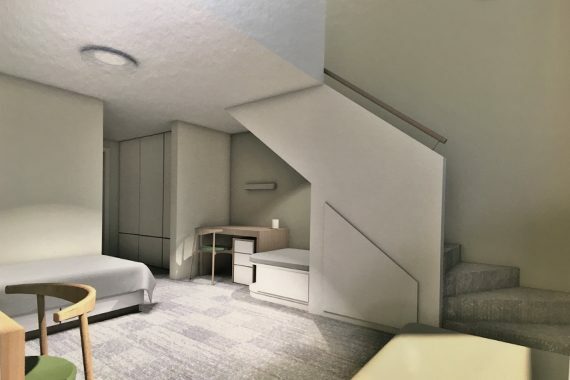 The first phase, focussed on the fifth floor of the Millgate block, will create ten four-bed rooms, each split across two levels to create a mezzanine bed deck for two of the boys in each space. 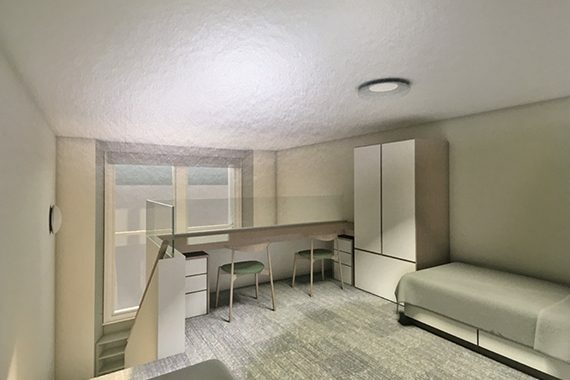 Individual study areas and storage will provide space for academic work and social activity, whilst a refreshed staff flat will maintain a high standard of supervision and support for all of the boarders in our care. We hope that the first rooms in the new-look Boys’ House will be occupied by September 2019. Based on the students’ reactions to the plans over our recent Open Weekend, they’ll be a very welcome improvement! The work has been generously supported by the Oglesby Charitable Trust. We’re delighted that, with their support, we’ll soon be able to offer accommodation to match the quality of our music and academic programme, providing a genuinely joined up approach to boarders’ overall wellbeing.